Time cockpit can export every list to Excel, Word and PDF. Therefor, it provides an automatically generated print view which contains all columns of the list. 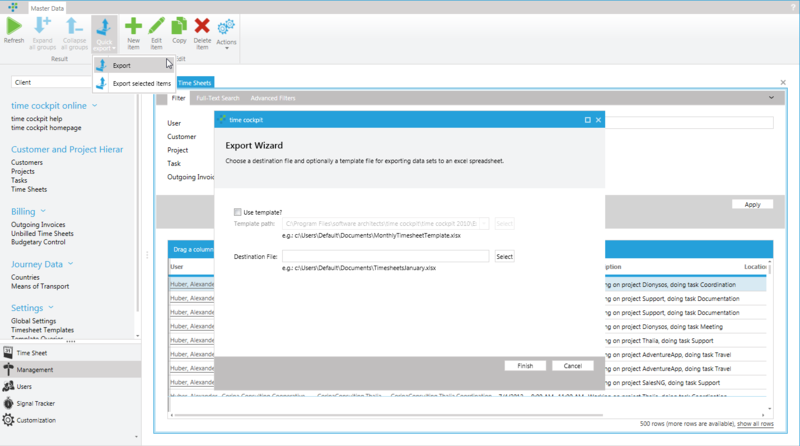 If you only want to export parts of the list, you can build custom print views with Microsoft Reporting Services (SSRS). The full client of time cockpit offers another way to export data of a list to Microsoft Excel. Use Quick Export in the ribbon. You can either export all the records in a list or only the selected items. You can use the quick export with or without a template. A template allows you to format the data in a special way or to add analysis or charts. Please note, that time cockpit can only work with Microsoft Office 2007 or newer. If you are using older versions of Microsoft Office, you will have to use the Microsoft Office Compatibility Pack. When exporting your data without a template, all columns of your list will be exported. The generated Excel file contains all filter conditions and all data. Groupings will not be considered. Time cockpit searches for a named range TemplateRow in the template Excel. This area may contain TCQL Expressions in square brackets (e.g. [=Current.USR_ProjectCode]). You can access the exported objects with Current. Use CTRL + F3 to access the Name Manager of Excel to set the named range TemplateRow. Outside the TemplateRow you can arrange everything the way you like. It will not be changed during export. Data below the TemplateRow will be moved down. Formulas containing references to the TemplateRow will be automatically extended (see comment in screenshot below). So you can add total lines to your template. Time cockpit ships with a template for the default Time Sheets list. You can find the template TimesheetListPivotAnalysis.xlsx in the installation folder of time cockpit.